The spring of 2004 was hot and dry until May 22nd when rain fell in torrents. 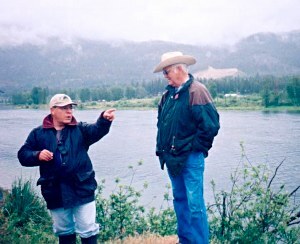 Arne Raven, manager of the Wolf Ranch, stared down the narrow road to the South Thompson River. The normally dry track teemed with water. "Usually we’d drive down", declared Arne, "but, today, we’re walking." He shouldered a shovel and led the way. It wasn’t a straight shot to the river, though. As well as stopping to dig hound’s-tongue, participants halted to hear range-ecologist Alf Bawtree describe surrounding vegetation, note layers and levels of soil types in the bank and admire a bald eagle watching them from a tall pine. Nan’s Weekend, which originated in Oregon, brings together a cross-section of people who share an enthusiasm for nature and want to learn how it can co-exist with human activities. Participants begin to understand constraints on ranching operations; ranchers experiment with stewardship and habitat protection. People had traveled from Vancouver, Victoria and Lytton for this May 22nd experience. Arne describes the philosophy as "Come and have a look! Take people out on the ranch. Get them talking. Involve them." It seems to work. "On that soggy Saturday", Arne said later, "I turned around and saw people plodding along the river in rainy weather with wet feet but big smiles on their faces. " Nan’s Weekend 2004 had four goals: assess the results of several year’s fencing and replanting along the ranches riparian zones on the South Thompson river; observe the effects of the 2003 wild fires on the ranch land; monitor signs of wildlife inhabiting the ranch; and uproot hound’s –tongue. The Wolf Ranch maintains habitat for wild animals as long as that doesn’t interfere with cattle and hay production. A trail of salmon bones along the river bank shows how well bears have adapted. In autumn they fish returning salmon from the river, taking them up on the bank to eat. Geese use the river shore as do ducks, and a variety of wading birds. Osprey nest on the ranch and curlews march through its fields. Moose and both white-tailed and mule deer are common on the ranch. In 1999, to combat an erosion problem, the Wolf Ranch began to water its cattle away from the river. Several miles of shore line were fenced off and 2,000 willows and 2,000 firs and spruce planted along the bank. The willows, with their nets of underground roots, seem to have taken hold better than the conifers. Fencing may also give native cottonwoods a chance on ranch land. They are in danger of disappearing elsewhere as human development increases with everyone wanting a water-front lot. There was heated discussion about the needs of cottonwoods versus the needs of bank beaver which gnaw them. Consulting biologist Rick Howie is excited about the potential benefits of protecting ranching riparian zones. Each site is different, he cautions, with its own growing conditions. However, trees along the bank provide shade and insect drop for fish. Leaf litter and small woody debris are very important for smaller streams. Leaves provide organic material which, as it decays, nourishes small vertebrates, which in turn, feed fish. Larger tree branches not only give direct physical cover for fish to hide under, but can change the current, creating quiet spots and eddies for them to rest. The larger the woody debris that falls in, the greater the complexity of the stream and the more benefits to the fish. In a straight stream fish have to move constantly just to maintain position. Vegetation on the side also moderates the effect of heating on the water. Over time a well grown layer of trees and shrubs could become an inexpensive way to fence off the stream and prevent erosion. In 2003, two thousand acres of Wolf Ranch’s deeded and leased land were affected by wild fires. More would have been had the ranch people not made a stand with a water truck on a ridge, where they beat back the fire and prevented it coming down hill across their fields. Nevertheless, participants in a previous Nan’s Weekend were shocked to see tall firs reduced to blackened spars and formerly healthy grassland edge ecosystems scorched. 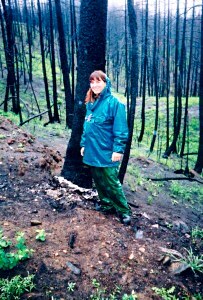 The fire was so intense it burned roots deep underground. People exploring on what seemed like stable, if charred, soil had the unsettling experience of plunging down as the burned root systems gave way. Miles of fencing also burned. Tamie Hucal, boss of the fencing crew, described the difficulty of walking and working on treacherous ground and over piles of downed trees. On slopes the crew had to contend with large holes from burned tree roots. However, in two and a half months, by May 2004, most replacement fencing was done. Tamie, who has thirteen years of field biology in the Yukon, noticed large numbers of migratory birds passing through. Spring buttercups were a bright yellow contrast to their blackened surroundings. Arne says the Wolf Ranch will look at the positive side of the fires and try to adapt. Alf Bawtree has been hired to evaluate the damage and advise on action. Alf hopes to get back to and then maintain the seral stage of vegetation. On one bare hillside, that May weekend, there were blue bunch wheatgrass roots, but no top growth. "I don’t think blue bunch wheatgrass can thrive and survive without occasional fires." Alf notes. The ranch will encourage natural regeneration. 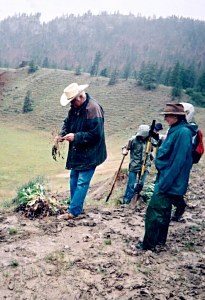 In the spring of 2004 , four inch seedlings of Ponderosa pine had come up in some locations. The ranch plans to allow some smaller burned trees, six to four inches at the base, to remain standing, believing that they will provide some protection for wildlife and help little trees to survive. The aftermath of the 2003 wild fires is of great interest to Gary Hunt and his students in the Natural Resources Studies at Thompson Rivers University in Kamloops. As an Honours component of a BSc. Gary’s students are studying the establishment of tree seedlings on the fire area, how certain fungi establish themselves on root systems and how seeds take root in burns. They emphasize both dendrology and mycology , and are finding species of fungi not noted in existing guide books. Gary points out that damage from disturbance of a site, compacting and trampling of the forest floor, can be as harmful to the mycorrhizal fungi as fire. These fungi, which live on a tree’s roots, radiate out, thus vastly expanding the tree’s own root system, making it stronger and longer lived. It’s difficult to find secure sites to study post-fire ecology, but the Wolf Ranch has welcomed Gary and his students. Their work collecting, documenting and archiving specimens will aid both provincial efforts and North American research into fire effects. 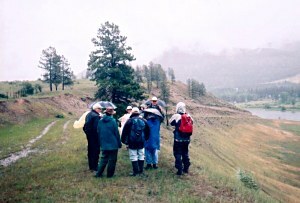 All participants in Nan’s Weekend 2004 praised the Wolf Ranch for its open working relationship with conservation research which will benefit both ranching and nature into the future.